The localisation and investigation of settlement sites of the third millennium before Christ in the North German Plain are in the focus of the project C1 Late Mesolithic and Neolithic Transformations on the Northern and Central European Plain. 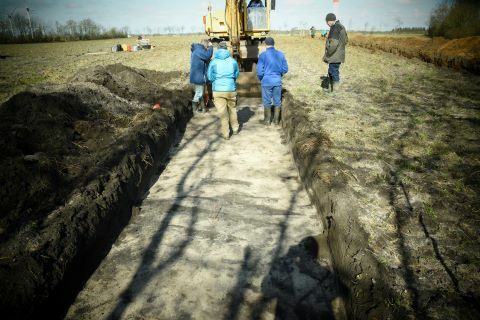 Within this framework, archaeological preliminary investigations were carried out in March 2019 in Westre, near Flensburg in the district of Nordfriesland in the immediate vicinity of the German-Danish border. The site had already been visited by collectors for several years and is characterised by extensive lithic find material of the single grave societies between 2800 and 2200 BC. The investigations were carried out systematically by five excavation sections, up to 80 m long and situated side by side. However, no Neolithic contexts such as pits or postholes were detected. Several clearly visible structures in the ground were identified as remains of former field fortifications of the 20th century in the form of trenches by the excavation as well as by the report of residents present. The prospection demonstrated that further investigations at this site would not be promising. Therefore, further potential Young and Late Neolithic settlement sites are now being tested for their potential in subproject C1. Subproject G2 conducted during the first two weeks of August fieldwork in Slovakia near Vráble in cooperation with colleagues from C2 and F2. The main objective was a coring campaign with a 22 mm diameter auger corer. 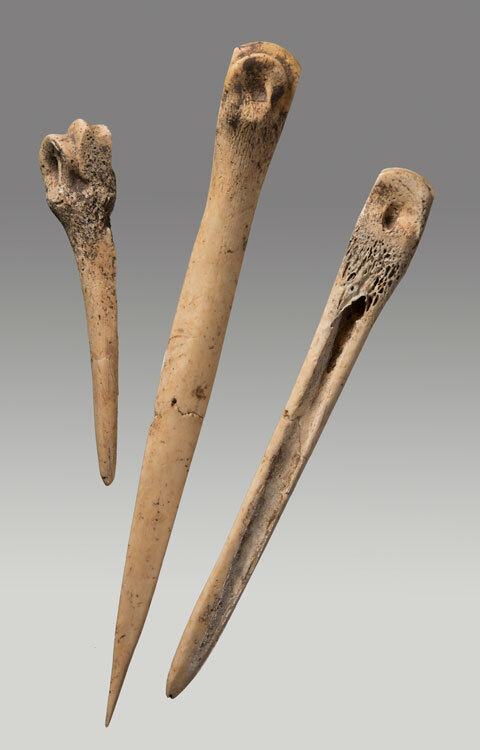 The corings targeted the house-accompanying ditches of the Neolithic site with high-resolution of up to 25 cm distance between two corings. 116 boreholes have been cored manually up to a depth of 2 m. The magnetic susceptibility has been measured down-hole and will be used to derive a quantitative interpretation of the magnetic map. Based on the distribution of the susceptibility and the description of the corings, the depth and shape of the ditches can be deduced. 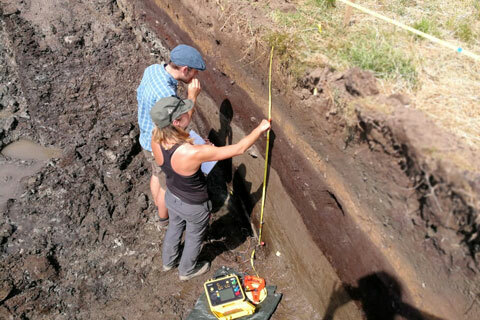 Furthermore, the susceptibility is measured directly on the archaeological sections in the excavations close to Vlkas and Ulany. This yields further high-resolution distributions of the magnetic susceptibility, which can be directly compared to the archaeological documentation. This summer subproject F1 conducted a geomagnetic campaign at Monte da Contenda, Portugal, which ran from the 10thto 23rdSeptember. Monte da Contenda is located in the Alentejo region of Portugal and is one of the many recently identified Late Neolithic and Copper Age ditched enclosure sites of this region. Previous work done at this site, by one of our Portuguese collaborators, Antonio Valera, had disclosed a series of circular and oval enclosures but given its large dimensions it was not possible to identify the full extent of the site at the time. However, during this last summer campaign, we finally obtained a full picture of the site revealing many more enclosures and several smaller scale structures. Sites like Monte da Contenda are important because they reveal, alongside sites such as Perdigões, Santa Vitória, and Valencina de la Concepción, a very interesting phenomenon in which occupation ends abruptly towards the end of the III Millennium in Southwest Iberia. This abrupt end, which still requires considerable amount of research to fully understand, entailed the complete abandonment of previous economic, social, and ideological practices associated to ditched enclosures. Sensor geomagnetic device being operated by Christophe Rinne and Katrin Anna Lehnen (Photo: Sebastian Schultrich, CAU Kiel). Jaspoide schist arrowhead found on the surface of the site (Foto: Artur Ribeiro, CAU Kiel). 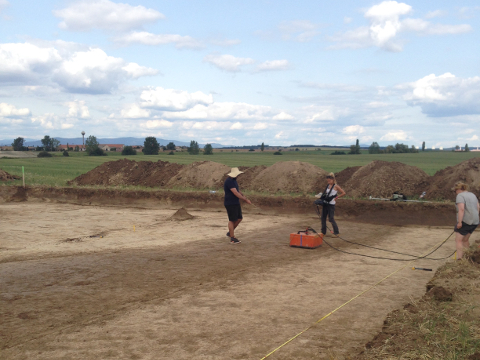 This year's excavation campaign of CRC subproject C2 took place from 30 July to 7 September in Slovakia at two neighbouring settlements of the project's previous main focus, Vráble. These two settlements, Uľany and Vlkas, had been intensely geophysically prospected and surveyed during previous campaigns. Parallel to the excavations, the prospections were completed in cooperation with subproject G2, so that the extent of the settlements can be given relatively exactly as 5.5 ha and 10.5 ha respectively. In addition, the Maña site was prospected. This showed that the LPC settlement there actually consists of several settlement cores, each situated on bumps and only between 1.5 and 2.5 ha in size (5.5 ha in total). 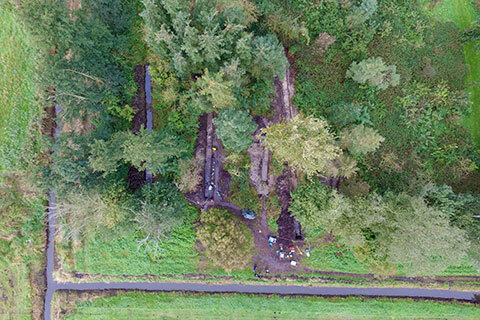 In addition to presumably Eneolithic houses and undated ditches, a previously unknown, probably Bronze Age ring ditch with a diameter of 80 meters was discovered. The excavations concentrated on several long pits accompanying the houses in order to extract material comparable to Vráble. In addition to considerable amounts of burnt clay and pottery (fig. 1), some bone artefacts were uncovered (fig. 2), which provide promising material for further research. 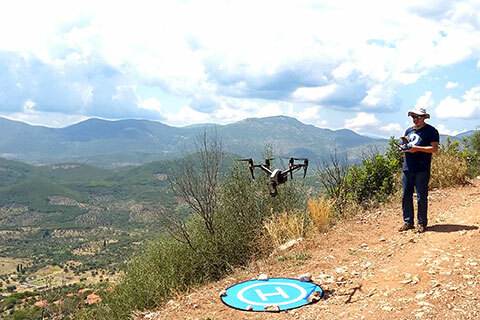 In August 2018, CRC sub-project E3 together with the Society of Messenian Archaeological Studies and the Heinrich Schliemann-Institute of Ancient Studies at Rostock University conducted a four-week field campaign in the sanctuary of Artemis Limnatis in Messene. The hellenistic sanctuary is situated in a prominent location at the slope of the Ithorne high above the city of Messene. 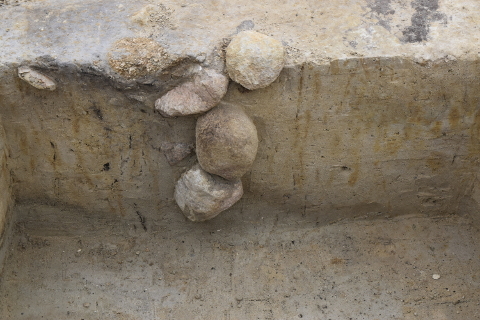 This year, the adjoining buildings were graphically recorded and archaeological soundings in the area of the adjoining building D and the terasse E were carried out in order to sort out their former use and dating. Drone flights by members of the Geographical Institute of Kiel University (chair for landscape ecology and geoinformatics) served to create a topographical map and a to visualise the site and selected buildings. The topographical visualisations as well as the records of the buildings now provide a basis to examine the mutual influence of built and natural space of this for the city of Messene important sanctuary. 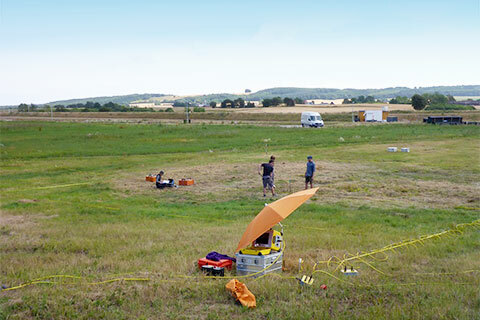 At the beginning of July (9th-13th) subproject G2 conducted geophysical measurements in an area of multiple kettle-holes in the vicinity of Horsens (Denmark). With support by subproject B1 and staff from the Horsens museum as well as the Danish National Museum a multi-method approach was used. Electrical resistivity tomography (ERT), ground penetrating radar (GPR), electromagnetic induction measurements (EMI) as well as in-situ measurements of the electrical resistivity at geological profiles and drillings were performed. The aim of the fieldwork was to compare the results of the geophysical measurements with the actual stratigraphy to improve the interpretation. In February and March 2017 excavations of a Lateglacial site were conducted in the same area by subproject B1. 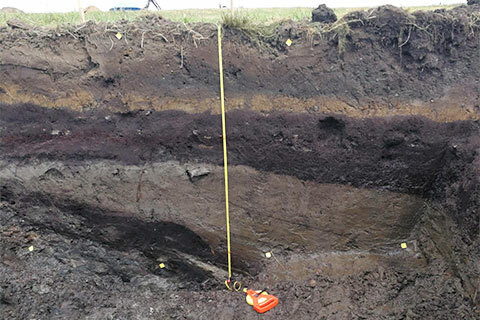 At the moment, a sediment column deriving from that kettle-hole is palynologically investigated by subproject B1 and the Danish National Museum. The present wetland of the Oldenburger Graben in Ostholstein was shaped 5000 years ago by a fjord that turned into a lagoon over time. Nowadays the landscape is characterised by an island-peninsula situation that exhibit a variety of Mesolithic and Neolithic sites. In order to develop a high-resolution model of transformation processes in the time frame from the late Mesolithic to Neolithic, subproject C1 “Late Mesolithic and Neolithic Transformations on the Northern and Central European Plain“ excavated a settlement place at the peripheral zone of the Oldenburg Graben in March 2018. Known by surface findings, the spot is located near a Neolithic site associated with the transformation phase of the funnel beaker to single grave culture around 2900 BCE that we investigated in summer 2016. 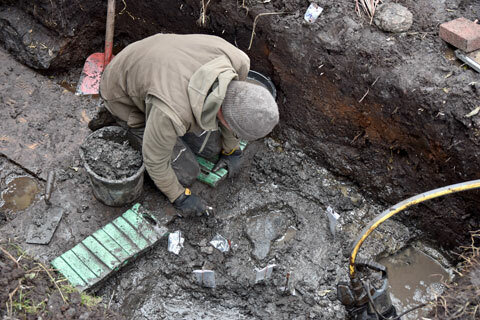 Ceramic finds found during the latest excavation in the Oldenburger Graben prove a Neolithic phase for the site, but other findings also indicate an earlier Mesolithic occupation. The archaeobotany investigations that were carried out on-site by subproject F3 "Dynamics of plant economies in ancient societies" obtained botanical macro-remain for further analysis, such as the reconstruction of food acquisition and agricultural practices in this period. 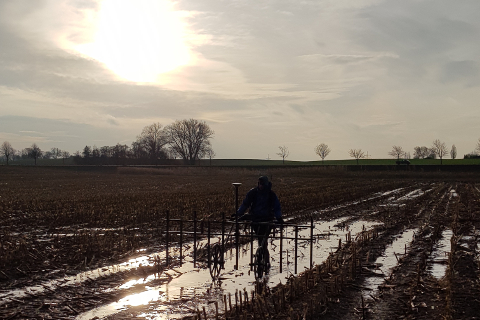 One week before Christmas, subproject D2 went on the last fieldwork campaign in 2017. The aim was to investigate the Late Neolithic (ca.2900 BC) settlement “Ebsdorfergrund-Wittelsberg 7”. The settlement is situated in a depression surrounded by the Central Germany Lower Mountain Range. Together with 3 students the measurement was successfully carried out. With the team, also winter arrived to Central Germany and the christmas spirit was enhanced by snow and ponies. In 1988 and 1990 the south-eastern part of the settlement was excavated. A few houses, pits and a ditch system gave important insights to the economic practices of the Wartberg Culture. Although a geomagnetic survey was already carried out in the 90’s, the dimension of the settlement as well as the course of the ditch system remained unclear. The survey of D2 clarified these issues and added a few new pit houses to the settlement. 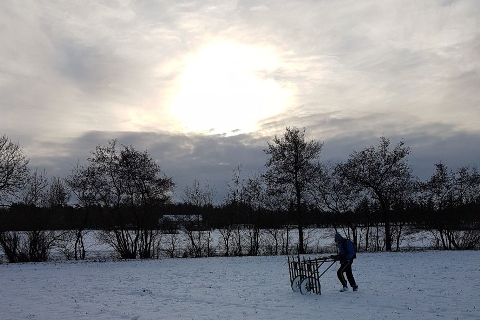 Affiliated to subproject C1, geomagnetic measurements have been undertaken in Westre (district Nordfriesland) and Oldenburg (district Ostholstein) on the 12th and 13th of December to investigate potential Younger Neolithic (2850 – 2250 BC) settlements. A central aspect of the subproject is to examine the transition to the period which is linked to the emergence of the so-called Corded Ware Culture. This transition is lively being debated in recent research, as it is accompanied by massive changes in material and immaterial culture. The Younger Neolithic in the North German Plain is predominantly represented by numerous of Burial mounds. These mounds testify that social transformations happened, as they consist of single inhumations highlighting social status, in contrast to the formerly anonymous burials in megalithic tombs. Compared to burial sites, Younger Neolithic settlements are very infrequent in Northern Germany. However, investigating those settlements is of high importance in order to better understand the processes that took place in the early third millennium BC. The aim of the geomagnetic measurements in Westre was to detect places which might be worthwhile for future investigations. Since the middle of August until the beginning of October the subproject G2 ‘Geophysical Prospecting, Classification and Validation of Settlement Remains in Changing Environments’ conducted fieldwork at the sites ofVráble (Slovakia) in cooperation with subproject C2 and Stolniceni (Moldova) as well as Maidanetske (Ukraine) in cooperation with subproject D1. 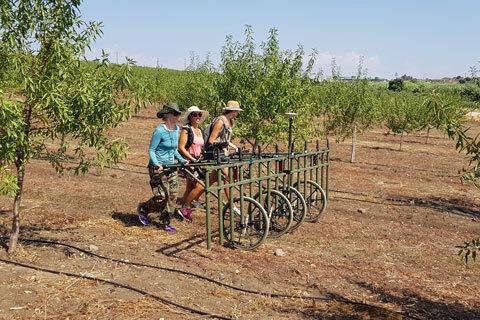 A multi-method approach consisting of the methods electrical resistivity tomography (ERT), ground penetrating radar (GPR), electromagnetic induction measurements (EMI) and magnetics was used to map the archaeological features of the different sites. 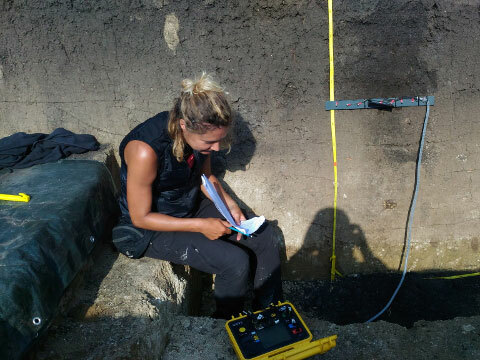 ERT, GPR and EMI have not only been conducted on the surface but also in open archaeological trenches. 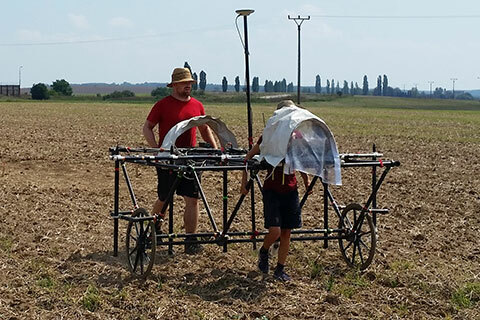 Furthermore, in-situ measurements of the electrical resistivity and the magnetic susceptibility have been conducted on the surface, in open archaeological trenches and boreholes in cooperation with subproject F2. The campaigned focused on gathering high-resolution multi-method data of key-targets. Near the village of Nahe (district Segeberg), a coring campaign of the subproject B1 took place on Tuesday and Wednesday (17th-18th October). The coring site is located in a rich archaeological landscape close to Lateglacial sites attributed to the so-called Hamburgian and Ahrensburgian. 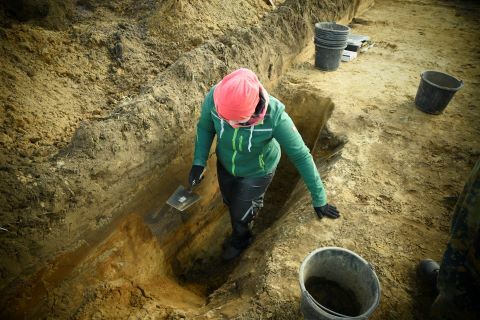 The Hamburgian people were pioneers that were the first humans to settle in northern Germany after the retreat of the vast inland glaciers of the last glacial maximum. The Ahrensburgian reindeer hunters mark the end of the Palaeolithic in northern Germany at the transition to the Holocene. With the help of Walter Dörfler (F2) and Jan Weber (E1), a total of 34 m of sediment could be obtained from a former meltwater lake. Those sediment cores showed that in the lower part of this stratigraphy laminated sediments from the Lateglacial were preserved. Previous pre-investigations by Hartmut Usinger during the early 2000s have suggested that sedimentation conditions in the deeper part of the lake sequence were mainly undisturbed and dated to the end of the Pleistocene. These conditions make diverse, high-resolution analyses possible. In the next weeks and months, subprojects B1, E1 and F2 are going to analyse the sediments with different palynological, geological, and geochemical approaches. The numerous analyses will contribute to study human-environmental interactions from various points of view and help answering archaeological questions with natural scientific methods. After excavating a Neolithic site in Duvensee, subproject C1 proceed with their fieldwork at the eastern coast of Schleswig-Holstein, between Kappeln and Eckernförde. Nowadays surrounded by wetlands, the site Brodersby-Schönhagen was in Neolithic times an island or peninsula. A cultural layer covers the settlement, which is characterised by a high number of finds and several activity areas, such as workplaces for flint production. In the wet areas, bone fragments and bone tools have been found. Currently, the archaeological material includes more than 2000 artefacts. 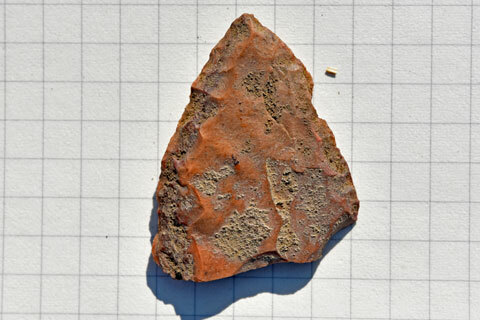 Decorated ceramic shards and flint axes enable to date the settlement of Brodersby-Schönhagen in the transition phase from Middle Neolithic to the Younger Neolithic. To that time, the change from funnel beaker culture to the single-grave culture in the third millennium BC took place. This is a transformation process in Northern Germany and South Scandinavian Neolithic characterized by substantial changes in social organisation which are the focus of subproject C1.